I've had Usagi for only 3 short months. 10 days ago she was diagnosed with pneumonia by the vet, and started a regimen of anti-biotics. Unfortunately, this didn't help and she got worse and stopped eating a drinking by herself. My partner and I have been hand feeding her water and food through a syringe to try prolong her life, but it wasn't looking good. She was suffering. Today i made the decision to put her down. Here are some photos of Usagi in her prime, when i first got her, and when she had her litter, and her coffin. This is her when i first bought her. She kinda looked like a rabbit so I named her Usagi (japanese for rabbit). I didn't know she was pregnant when i first bought her, she wasn't showing at all! But she had given birth a week later. This is two weeks after she gave birth. Her hungry pups are following her everywhere! 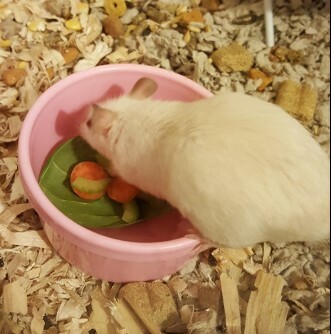 This is Usagi eating a salad i made for her. RIP Usagi. This is the box they put her in after the procedure. I appreciated that the nurses went to pick flowers to put on her box. 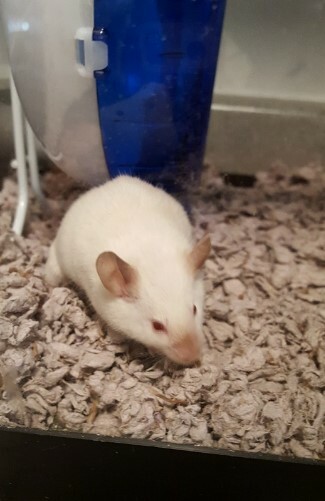 She was a really good mouse. Never bit me, always crawled into my hand to be fed treats. He daughters are not so nice to me lol. Aw, the flowers are a sweet touch. It sounds like she was a very good (and beautiful!) 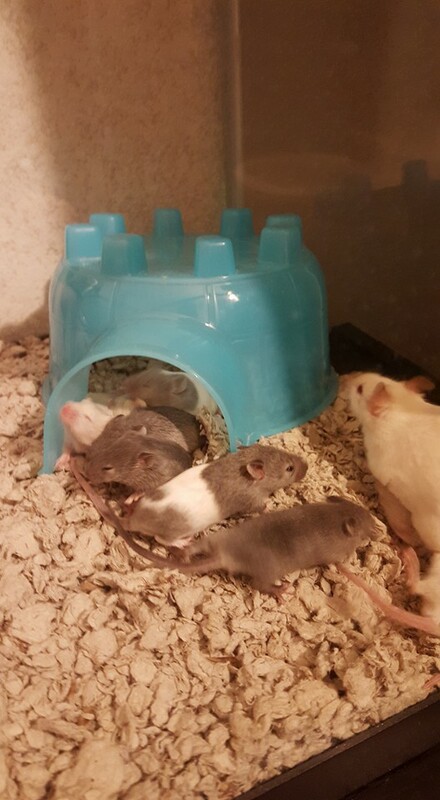 mouse, I'm sorry for your loss. Aaw Soren, I'm so sorry to hear this. Those are some lovely pictures. Her time with you may have been short but it sounds like it was a good life As long as you have her daughters (and possibly grand-daughters) you will always have a part of her, and of course she will live on in your memory always. Rest in peace Usagi. And those are some really beautiful flowers! That looks like the coffin of a VIM (very important mouse). The coffin is beautiful, it sounds like she was a lovely mouse. I'm so sorry for your loss, Soren. She was a truly beautiful girl. It's so hard to let them go, but she's in peace now. Such a beautiful siamese! I'm sorry that you had such a short time with her but Usagi certainly had a very full little life and left you with the gift of her children. 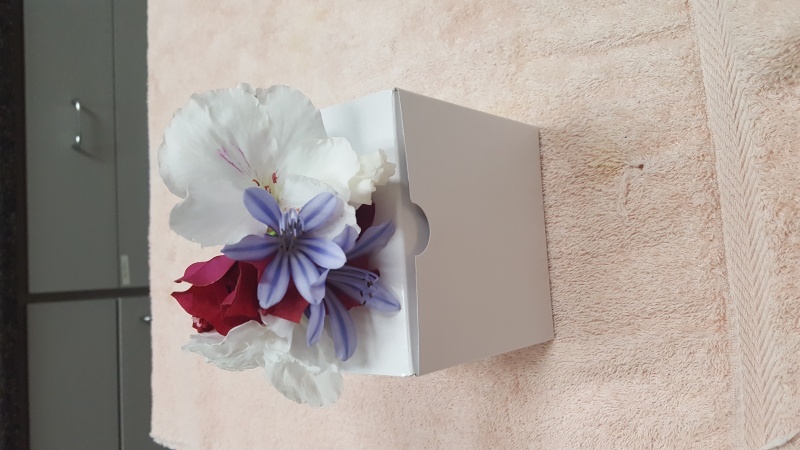 Her coffin and flowers are beautiful -- it's comforting to know that there are veterinary practices that understand that the loss of any pet is to be treated with respect. RIP. What a creative name. I love Japan and I love how you used Sailor Moon's name as well! Rest in Peace Usagi. I'm so sorry for your loss, she seemed like a wonderful little mouse. I was rooting for her to get better, but sometimes it just isn't possible. You made a good decision; no more suffering for her anymore. Thank you for the support everyone She'll be able to rest in peace. I got a card in the mail from the vet as well. It's very sweet. That is so sweet and thoughtful! I've never had a vets do that for me! How lovely to find one that acknowledges a mouse's importance! What a great Vet office. The forget-me-not seeds are a very nice idea. @MouseLover wrote: That is so sweet and thoughtful! I've never had a vets do that for me! How lovely to find one that acknowledges a mouse's importance! 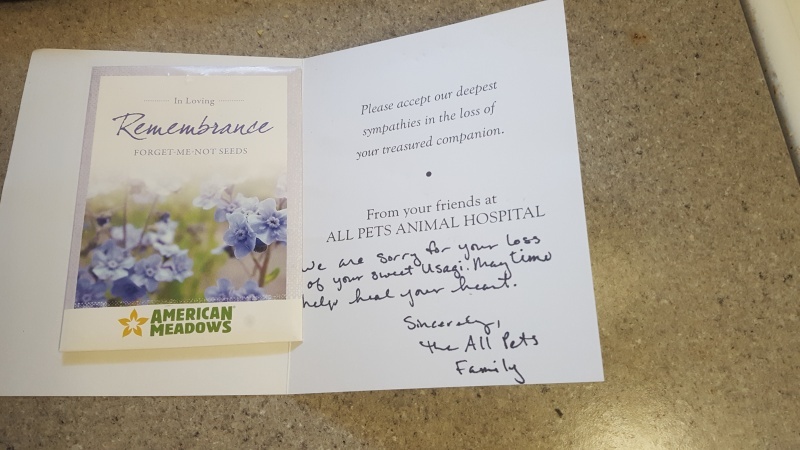 I've had animals pass away that were treated at different veterinary practices and, each time, I received a pet condolence card from that practice -- even the 24-hour emergency clinic where one of my cats was a one-time visitor and ended up being euthanized there. It's comforting to know that veterinary staffs take their patients to heart and empathize with our loss -- they understand that the animal was a vital part of our family, be it a dog, cat, hamster, mouse, etc. Aww... I've gotten cards for my cat and my mouse, but the forget-me-not seeds are a very sweet touch. With a dog or a cat, it doesn't surprise me. But it really touches my heart to see mice given the same respect.